I’m pleased to be quoted and want to help you think about how this affects you, your CEO, boardroom and business: “Directors are responsible for oversight of the corporation,” says the Stanford GSB paper. 1. What is the plan for monitoring social media to identify negative comments? 2. Who is responsible for responding on the social media platforms when crisis hits? 3. When is the CEO and/or board notified of a pre-determined spike in negative sentiment? 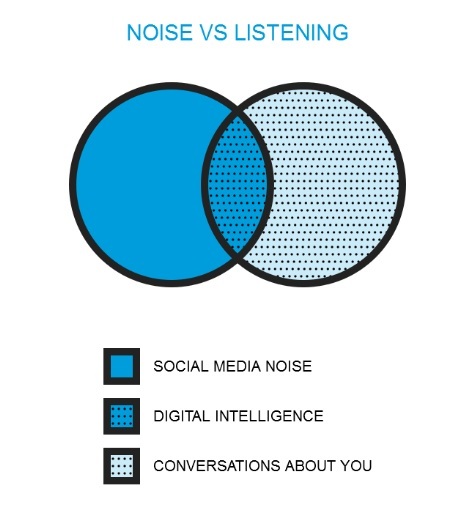 You may ask, what data can you get from real time conversations that are happening by your customers, employees and stakeholders? This is a great question, and one I’ve been doing a deep dive on. The feed of information is like a firehouse, so to make it relevant, you need to set up a point of view. The one I’ve selected to share with CEOs, the c-suite and directors is related to the conversation-influencing investors. I’m seeing many strategic insights coming out of this investor perspective. Think Money Ball for the boardroom, and I’m feeling like the Jonah Hill character. If you’re interested in learning more, email me at fay@riskforgood.com or call me at 310-902-3727. 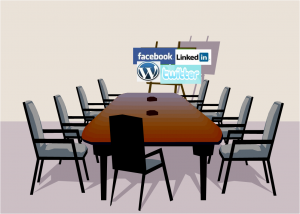 Click on the image to read: Monitoring Risks Before They Go Viral: Is It Time for the Board to Embrace Social Media? Professor David F. Larcker, Sarah M. Larcker, and Brian Tayan prepared this material as the basis for discussion. Professor Larcker and Tayan are co-authors of the book Corporate Governance Matters. Sarah M. Larcker is Director of Account Planning at Digitas Health. The authors would like to thank Michelle E. Gutman for research assistance in the preparation of these materials. 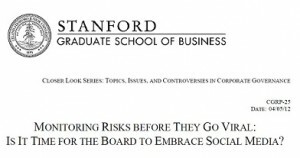 The Corporate Governance Research Program is a research center within the Stanford Graduate School of Business. For more information, visit: http://www.gsb.stanford.edu/cgrp/ or contact Associate Director Michelle E. Gutman at mgutman@stanford.edu. Copyright © 2012 by the Board of Trustees of the Leland Stanford Junior University. All rights reserved.